ACDSee 9 makes organizing your photos quick and easy, so you can play with and share the great photos you've got. Get Photos fast from any storage device, and ACDSee 9 automatically categorizes your shots based on metadata information (e.g., keywords, size, date taken). You don't even have to lift a finger. You can also use new password protected Private Folders to store confidential information. ...... g., keywords, size, date taken). You don't even have to lift a finger. You can also use new password protected Private Folders to store confidential information. Get an array of rapid full-screen quick viewing tools, time-saving Print Layouts that make your home printing easier and less confusing, as well as powerful email options, slide shows, CD/DVD burning, and web album tools that make sharing your photos as easy as can be. Enhance your photos with quick fixes like red-eye removal, color cast removal, exposure adjustments, and the Photo Repair tool. Batch rename, crop and resize lots of photos at once, then quickly drop them into folder systems, ratings, or custom categories. With ACDSee 9 you can instantly fix photos that are too dark or too bright with the new Shadow/Highlight tool. Organize, enhance, and share in the blink of an eye. Organize slide shows or simply for viewing and selecting photos. Very easy to use photo managing software with html generator and ftp. 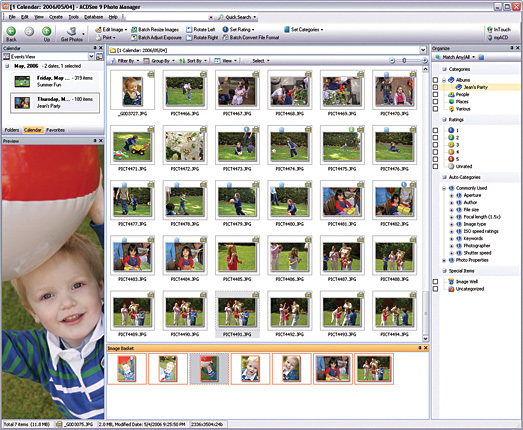 AnvSoft Photo Manager helps you creatively organize, edit and share photos. Qweas is providing links to ACDSee 9 Photo Manager 9.0.108-en as a courtesy, and makes no representations regarding ACDSee 9 Photo Manager or any other applications or any information related thereto. Any questions, complaints or claims regarding this application ACDSee 9 Photo Manager 9.0.108-en must be directed to the appropriate software vendor. You may click the publisher link of ACDSee 9 Photo Manager on the top of this page to get more details about the vendor.